Everybody say hey! Everybody say, um, something else! Now everybody sit down and chill out. I wouldn't do much good as a frontman, agent provocateur or agitator-in-general. But that's ok. I can live with that. 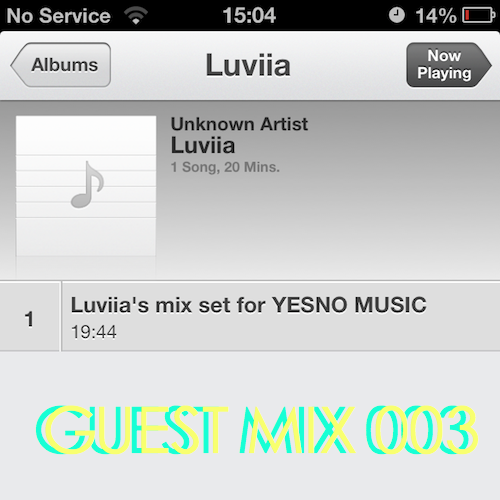 In any case, everybody should sit down and chill out now cause I have a lovely Guest Mix - the 3rd in this series - courtesy of Taiwan-based beatmaker Luviia. I first stumbled across this guy through Taiwanese rapper Aristophanes' work; one of the beats to her tracks was crafted by Luviia. I first wrote about his track 'Coppertone', then he released his P2P Feelings EP - his style is old school, marked by crackling samples and hefty doses of boom bap beats, yet tinged with modernity, influenced by the revival in lounge-type vibes and 80s throwback sounds. His process, his creative flair, is eclectic: "I always listen to a lot of different music and flick through random vinyl, just sample anything I see or hear. Cos everything is music!" His mix shows off his favourite sounds in hip hop. There are some truly experimental tracks in amongst this mix; Repeat Pattern being one of them, Lidly another, REZ, Linn... they're all great, in fact. All of them exude different notions of what instrumental hip hop could or should be, yet all tied with the uniting factor of being intended for chilling out, for horizontal living, for filling the empty air of modern spaces with soothing sounds and the smart offbeats of hip hop. And this stuff is VERY SPECIAL cause, well, Luviia says why. "All these tracks are unreleased or new releases, I'm so honoured that I got some tracks from these artists!" he said. "Hopefully everyone will enjoy it! Respect though. Blessings!" So with no further ado, please check it out. 12. Tarik Sabar - Rah!